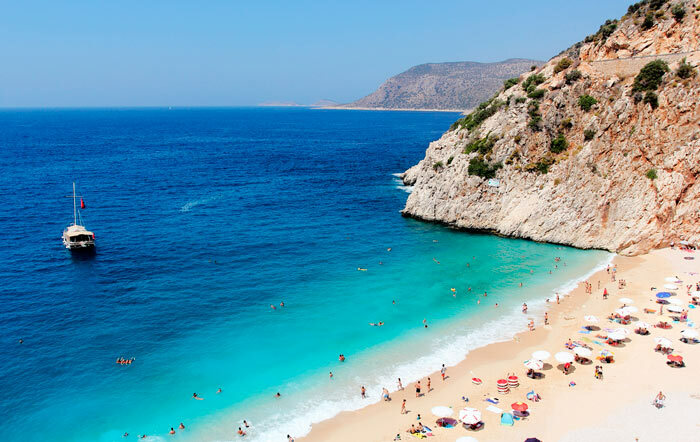 Kaputas — beach unprecedented beauty in southern Turkey, from Antalya to him about 210 km, the closest city — Kas. From porridge to here can be reached by bus or a rented bicycle. In addition to tourist destination is brought by boat from the sea. If you come to the beach by car or other vehicle, for the descent to the water will have to overcome 190 steps. Kaputas Beach crouched between two mountains, in the valley. On the track it is not visible, so you can relax without worrying about extraneous eyes. Usually on the coast is not many people because of its location. Near the sea there are no shops or places of entertainment. All you need to bring with them better. Among the elements of civilization resting on the beach are only offered umbrellas. Total beach length is 150 meters. Water attracts vacationers for its pleasant turquoise waves. Especially the beauty of the water can be seen from the road. The surface of the shore is covered with yellow sand mixed with shingle, which does not prevent walking. The descent into the water is soft, sloping, no sudden changes of depth.